Why AI? Other digital companies are just catching on to the importance of data modeling. Other digital companies are just catching on to the importance of data modeling. Our use of data has already made us the largest digital marketing firm in the region, and we continue to grow exponentially. Traditional ad agencies make money by selling impressions. We think that’s a half-assed way of doing things. Instead, we drive qualified prospects to interface with the exact parts of your business that you need them to see. Then we deliver trackable conversions that grow your business and improve your ROI. Sound like a better approach? It is. How do we do it? Well, we’ve got a few tricks up our sleeve. We’re not talking email addresses given reluctantly at point-of-sale. We’re talking data that matches the exact characteristics of your target audience. AI will sit down with you and hash out exactly what your ideal market looks like. Once we know who you need to reach, we can eliminate wasted impressions and focus 100 percent of your budget on targeting people with a high likelihood of conversion. Want leads? This technology is the way to get them. We’ll give you lists of highly-qualified prospects who are already interested in what you do. Our data is 100% legally compliant. Very few companies in the United States can utilize this data the way that we do. 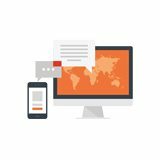 We will identify your entire market, land click-through inducements in their inbox, and drive them to your website. No gimmicks, just conversions. Actionable Insights is a Google-certified Partner Agency. Our team has a combined 36 Google certifications, and every single one of us is certified. What does that mean for you? It means that the people doing your marketing are experts at navigating the biggest digital marketing platform out there. 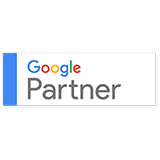 Google Partners are required to demonstrate strong growth for our company and for our clients in order to earn the Partner badge. We also get the latest training in the full suite of Google products, as well as community membership and product updates. See what digital looks like when it’s done right. Our team has some serious know-how. We stay out at the forefront of the ever-changing marketing game, bringing in the best tech on the market and shedding outdated and ineffective platforms before our competitors can catch up. Web design is changing. Marketing automation is changing. Social Media Marketing is radically changing. We’re on top of it all.